The month of November contains its own, built-in imperative: give thanks. In classrooms and dining rooms around the country, children will spend the next few weeks being prodded to answer one little question a thousand different times: What are you thankful for? And a thousand different times, they will offer up familiar answers: family, food, warmth, my iPad. Meanwhile, life coaches and intentional living gurus will flood social media channels cheering on our gratitude practice. Daily acts of gratitude, we are reminded incessantly, make us happier and healthier. In my experience, rote thank yous and awkward gratitude rituals too quickly lose all meaning. I don't know about you, but I'm tired of perfunctory and hallow traditions of thankfulness. Tired of smug declarations of gratitude. Tired of scrambling for a creative answer to that little question: What are you thankful for? When a good idea – like gratitude itself – begins to feel trite and inauthentic, it's time to give it a second, more scrutinizing look. It's time to freshen the approach. Let's talk about why that one little question is so unsatisfying. What are you thankful for? Perhaps because thankfulness is only a beginning. It's a passive emotion. You feel lucky, blessed. As in, Isn't it great that I have all of this food, family, warmth, and iPod time? How can we do better? Gratitude goes deeper. It's more active. True gratitude celebrates the giver as well as the feeling. As in, I'm thankful for my parents for preparing good food. I'm thankful for the service person that fixed our heater and warmed the house. I'm thankful for my grandmother for teaching me to bake a pie. True gratitude is both the feeling of thankfulness and the action of thanking the source of that good feeling. And while it's great that people who practice gratitude report greater levels of happiness and health, there are even more satisfying benefits to practicing intentional gratitude. There is so much more to be gained, personally and communally, by feeling thankful and reaching out with gratitude. It's time to adopt a method of giving thanks that feels meaningful, intentional, and empowering for every member of our families. It's time to reconnect with the simple wisdom at the core of gratitude, wisdom that is increasingly being confirmed and celebrated by scientific findings. For my own sake, and for yours, here are three ways we can reclaim the gift of giving thanks. Three ways authentic gratitude can create good in the world. Grateful people are more likely to be sensitive to the needs of others and to help others whenever they can, according to a 2006 study in the journal Psychological Science. The study found that grateful people treat others well even when it's difficult, even among strangers. Keep a family gratitude journal throughout the holiday season. Once each day, strike up a conversation using the questions below. Jot down your answers or have younger children draw pictures. Then brainstorm action you can take to show your gratitude. What made you happy today and who made it possible? A number of studies have demonstrated that gratitude is a powerful tool to get us through challenging or anxious times. Focusing on the good in our lives, along with recognizing and celebrating the sources of that good, give us the optimism and hope needed to overcome difficult situations. Focus on people who are the sources of good in your lives or in the world. Take care to express why you appreciate them. 3. Gratitude inspires us to engage with the world. Click here for tips to turn feelings of gratitude into acts of service. Gratitude can be a powerful motivating force for doing good in the world, especially if we are intentional about the actions we take as a result of our optimistic, happy, empathetic new superpowers. 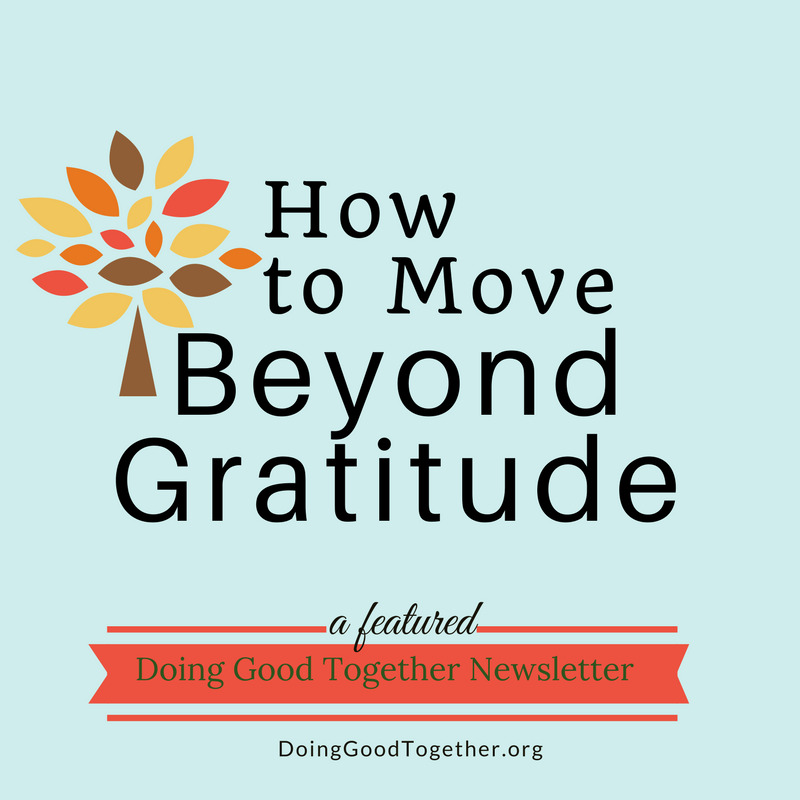 Explore the latest newsletter from Doing Good Together. It's full of practical tips to turn feelings of good into acts of service. This wisdom at the core of gratitude is undeniable if we can just push beyond the tedious interrogations of "What are you thankful for?" Let's each commit to a gratitude practice that inspires our families to feel and act thankfully. Let's be consistent with our efforts to appreciate the sources of good in our lives all year long, rather than relegating it to late November. And let's continue to reclaim the meaning and wisdom behind the sometimes-stale traditions in our holidays. How will your family give thanks? Browse our collection of tools for gratitude.